Are you aware of the nitrates contamination in drinking water and their consequences on human health? Being at the forefront of our health, it’s important to establish health hydration habits like drinking nitrate-free water. Nitrates are heavy oxidants that are harmful to humans and have been found to have short-term and long-term health effects. Even though there are several studies pointing out that nitrates could increase risks of cancer, due to the fact that nitrate is a precursor compound in the formation of N-Nitroso compounds, many of which are human carcinogens, the nitrate standard contains no safety factor at all. In other countries, such as Germany, the drinking water standard for nitrate is 4.4 ppm, more than twice as strict as the U.S. standard of 10 mc/L of NO3. HOW DO NITRATES GET INTO OUR WATER? In order to increase plant size and output, nitrogen fertilizers are used. When plants die, nitrates are released into the soil and serve as food for the synthesis of proteins and other nitrogen compounds. Human activity disrupts this balance through intensive use of nitrates loaded fertilizers in agriculture. The leftovers surplus of nitrates along with animal waste, contaminates ground water but also infiltrates spring water sources. The influence of men has increased level of nitrates in the world’s fresh water sources. Tasteless, colorless and odorless, nitrates are found in almost every bottled water on the market, except for AQUA Carpatica. Millions of years of hydrogeological activity naturally infuse AQUA Carpatica with essential minerals, balanced pH and naturally filter nitrates out of the water. Now let’s take a deep dive into the research investigating the health risks associated with drinking nitrate-contaminated water. The latest research reveals the health risks that underscore the need to address the issue of nitrates. The Environmental Protection Agency (EPA) failed to add a safety factor to the nitrate standard. The Maximum Contaminant Level for Nitrates is 10 mg of nitrate-nitrogen (NO3-N) per liter for all types of water. This level has been adopted by the U.S. Environmental Protection Agency (EPA) as the standard in the Primary Drinking Water Regulations. Since 1962 it hasn’t been updated and according to new research, the federal nitrate limit is not sufficiently protective. Both the World Health Organization and the United Nations, and also US and state regulations, recommend a maximum nitrate-nitrogen level no higher than 10 mg/l. The ideal level in human drinking water for nitrate-nitrogen is 0 mg/l. According to Environmental Working Group, nitrate levels should not exceed 5 ppm, based on evidence that nitrate can increase risks of cancer. In addition to threats of cancer, nitrate exposure in drinking water can cause a number of health problems such as: high-blood pressure, blood poisoning, thyroid disorders and even severe cyanosis. Once ingested and coming into contact with the stomach’s bacterial flora, nitrates turn into nitrites, which are much more toxic than nitrates, according to the International Agency for Research on Cancer. Nitrite enters the bloodstream and binds to hemoglobin, changing it to methemoglobin. Methemoglobin does not carry oxygen efficiently which could result in brain damage. Methemoglobinemia causes cyanosis and at higher concentration, asphyxia, as stated by the World Health Organization (WHO) dealing with nitrate and nitrite in drinking-water. Some adults may be more susceptible to the effects of nitrates than others. Gastric acid secretion failure increases sensitivity to the effects of nitrates. A wide variety of medical conditions, including food allergies, asthma, hepatitis and bile duct stones, may be associated with insufficient gastric acid secretion. Nitrite is absorbed in the blood, and hemoglobin that carries oxygen in the blood is converted to methemoglobin. Babies can become seriously ill if exposed to nitrate levels above 10 mg/L and are prone to nitrate-induced methemoglobinemia. Not only babies, but also adults with reduced stomach acidity, people suffering from stomach conditions such as gastric ulcers, pernicious anemia, adrenal insufficiency, gastritis, or gastric carcinoma are susceptible to the effects of elevated nitrate. There is also a proven correlation between high-blood pressure and increased nitrate exposure through drinking water. Two different studies published in 1971 and 1977 that examined the connection between nitrate intake and hypertension lead to the conclusion that there’s a link between nitrate intake and hypertension. The first study, published in the American Journal of Public Health, found a positive relationship between hypertension and increased nitrate exposure through drinking water. Among the parameters analyzed in drinking water: hardness, sodium, nitrate and chlorine, the strongest relationship was between elevated nitrates levels and increased hypertension. In the study, Republican River residents, with the nitrate concentration 3 times lower than the current MCL, had hypertension mortality rates. The second study, conducted on 18 communities in Weld Country, Colorado, provides some evidence supporting the initial findings. Among residents in the exposed communities, there was an earlier onset of hypertension. According to doctors, nitrates and nitrites are an important danger not only for infants, but also for adults. The risk is high and could cause not only intoxication but even more rapid phenomena, such as urticarias caused by nitrates and nitrites. More seriously, they can interfere in the thyroid activity, which coordinates all metabolism (protein, carbohydrate or lipids) and can be responsible with cancer. A study conducted by the National Cancer Institute,indicate that women consuming nitrate-contaminated water face a greater risk of thyroid cancer. Another study conducted by Danish researchers found that individuals drinking water with a high nitrate content exhibited a dose related increase in hypertrophy. This condition is marked by enlargement of the thyroid, the gland responsible for many of the body’s endocrine and hormonal functions. Based on other findings, there is also an association between nitrate intake and subclinical hypothyroidism in women. Nitrates can lead to the formation of nitrosamines, substances involved in the development of some cancer. Under the acidic conditions in the stomach nitrate is converted to nitrites. Once formed, nitrosating agents can react with amines and amides to form nitrosamines and nitrosamides, collectively known as N-nitroso compounds. Nitrate are considered probable human carcinogens. Nitrosamides directly alkylate DNA and may induce tumors in many organs. Certain nutrients are known to influence endogenous NOC formation in the stomach. Since 1976, there have been conducted 8 different human epidemiology studies in 11 countries, which indicate a relationship between increased rates of stomach cancer and increasing nitrate intake. A 1985 study in Britain, found that women exposed at greater than 7 ppm had gastric cancer risks, almost 10 % higher than women exposed at concentrations between 0 and 2.5 ppm. Thus, a study at the University of Iowa discovered a link between long-term nitrate exposures from drinking water and increased risks of ovarian and bladder cancer among postmenopausal women. A different study conducted at the same university in 2001, found the same association between long-term nitrate exposures from drinking water and increased risks of ovarian and bladder cancer in women. Ingestion of nitrate-contaminated water, in the range of 5 to 10 ml/L increases the risk of colon, ovarian and bladder cancer, as shown by the National Cancer Institute. These risks are highest for people with low vitamin C and E intake, red meat consumption, which increase the formation of N-nitroso compounds in the body. The United States National Research Council found suggestions of an association between high nitrate intake and gastric cancer.In a different study in the Piemonte Region of Italy researchers found a positive relationship between high nitrate content (above 4.5 mc/l as nitrate) in drinking water and communities having a significantly elevated cancer risk water (Gilli 1984). It’s dangerous to think that “water softeners” purify for nitrates, it is not the case. Under-sink gadgets do not remove nitrates from water to a significant degree. The purification of water through reverse osmosis, ion exchange or distillation vary in their effectiveness even when good handled. The best way you can ensure you are drinking low-nitrate water is to get the water from a guaranteed low-nitrate source. Nitrates are considered an acute toxin to infants, pregnant women and adults especially those with reduced stomach acidity and people deficient in the enzyme that changes methemoglobin back to normal hemoglobin, which are more susceptible to nitrate-induced methemoglobinemia. Nitrates do not disappear after boiling, on the contrary, boiling increases the concentration of nitrates and implicitly the toxicity. Prolonged intake of high levels of nitrate are linked to gastric problems due to the formation of nitrosamines. N-nitrosamine compounds have been shown to be carcinogenic in test animals. The N-nitroso compounds carcinogenic in animal species are probably also carcinogenic in humans. Studies of people exposed to high levels of nitrate are proving more and more evidence towards an increased risk of cancer. Nitrates in drinking water are far more dangerous than nitrates in food. In fact, most of the nitrate we consume is from our diets, but unlike dietary intake, drinking water is not accompanied by micronutrients that could inhibit endogenous nitrosation. To address the effects of nitrates on human health, a group of international researchers are also planning to conduct the largest-ever study of the effects of maternal consumption of nitrate-contaminated drinking water on birth outcomes among approximately one million babies. Adults along with pregnant women and babies are also prone to intoxication with nitrates, therefore it is important to take proactive steps and ensure that they drink pure water. AQUA Carpatica comes from a land completely untouched by man. Deep in the wilderness is the source of the purest, most perfect water in the world. In Romania along the Carpathian Mountains is the largest untouched forest in Europe. 60,000 square miles of wild forest, guarding over the influence of men. The only way to ensure you keep away from nitrates in drinking water is to get nitrate-free bottled water. 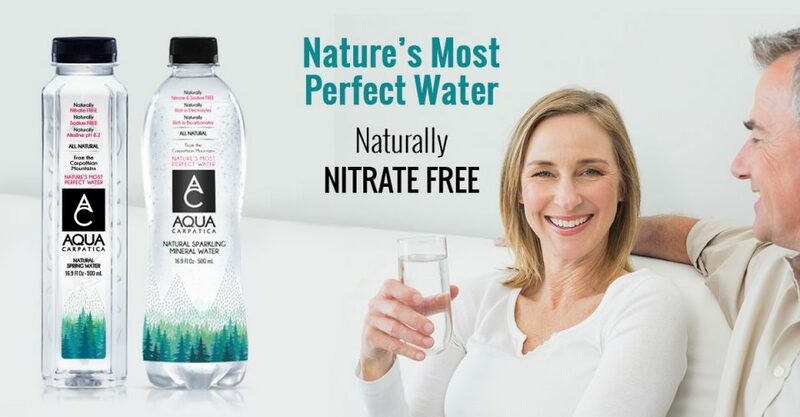 AQUA Carpatica Natural Spring Water is pure at the source and has ZERO NITRATES, making it safe for you and your family. The 40 year underground journey of AQUA Carpatica Sparkling Mineral Water guarantees a natural filtration process, keeping contaminants like nitrates away. Nitrate and nitrite in drinking-water. Background document for development of WHO Guidelines for Drinking-water Quality, World Health Organization 2011. Inoue-Choi et al., Nitrate and Nitrite Ingestion and Risk of Ovarian Cancer Among Postmenopausal Women in Iowa. International Journal of Cancer, 2015. M.H. Ward et al., Nitrate Intake and the Risk of Thyroid Cancer and Thyroid Disease. Epidemiology, 2010. Aschebrook-Kilfoy et al., Modeled Nitrate Levels in Well Water Supplies and Prevalence of Abnormal Thyroid Conditions Among the Old Order Amish in Pennsylvania. Environmental Health, 2012, 11:6. P.J. Weyer et al., Municipal Drinking Water Nitrate Level and Cancer Risk in Older Women: The Iowa Women’s Health Study. Epidemiology, 2001.